More than 400 VIPs were on hand for the Official Ribbon Cutting Ceremony and Phase 1 Advance Preview Celebration (see video at the end of this story) of the Global Center for Health Innovation. 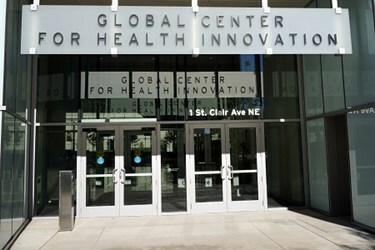 Located in Cleveland, OH, the Global Center “serves health and health care innovation, education and commerce through state-of-the-art spaces, programs and virtual offerings while building on the rich heritage and distinctive capability of Northeast Ohio health care,” according to its website. Key players in the development - and future success - of the Global Center for Health Innovations celebrate after the ribbon cutting. The Global Center will open to the public in February, 2014, but it “and the renovated convention center it’s attached to will host 34 health-related conventions, meetings, conferences, and trade shows,” according to Cleveland.com. Dave Johnson, spokesman for the Global Center, also told Cleveland.com 59 other events are confirmed for 2013, 23 health-related events for 2014, and 5 more health-related events for 2015. Cleveland.com notes the idea to create the Global Center for Health Innovation – at the time called the medical mart – came from Cleveland Clinic CEO Toby Cosgrove following a conversation with a Saudi Arabian sheik 18 years ago. "He told me he was going to build a medical mart and hotel in Dubai and I said, 'Well, there's clearly something we can do in Cleveland.' "
The Global Center has 235,000 square feet of space, 100,000 square feet of which is permanent showroom space for tenants such as Cleveland Clinic, GE Healthcare, HIMSS, Hyland Software, MetroHealth Medical Center, Siemens, and STERIS Corporation. Total cost of the project was $465 million. It has four themed floors: Health and Home on the first floor, highlighted by the State-of-the-Art Patient Home; People, Patients, and Caregivers on the second floor; Clinical Spaces on the third floor; and Health Care IT on the fourth floor. HIMSS occupies 30,000 square feet of the fourth floor and is expected to expand into the remaining 6,000 square feet within two years. According to Jim Bennett, CEO of both the Global Center and the Cleveland Convention Center, recruiting HIMSS was a big coup. According to the HIMSS release, “Supporting the value and benefits IT brings to patient care, the HIMSS Innovation Center Charter Collaborators are: Alego Health, the Office of the National Coordinator for Health IT, Fujitsu, IHE USA, ICSA Labs, Total Voice Technologies, Cardinal Health, Juniper Networks, and Concur. Cleveland Clinic’s 2013 Medical Innovation Summit will be the first event hosted by the Global Center for Healthcare Innovation. Dr. Thomas Graham, the Clinic’s chief innovation officer, told Crains “the summit is one of the institution’s main events, drawing more than 1,000 of the top minds in healthcare.” Crains notes, “It’s fitting that the summit will mark the official opening of the four-floor facility,” given the progressive health IT approach they share.